This 1962 painting, by v. Zveg, depicts the French fleet (on the left) engaging the British fleet (on the right) near the mouth of Chesapeake Bay. Naval History & Heritage Command describes the event: “In this tactically inconclusive but strategically decisive battle line action, the French successfully prevented the British fleet from entering Chesapeake Bay and relieving Major General Lord Cornwallis' army at Yorktown, Virginia.” Click on the image for a great view. After the patriots' victory at Cowpens (January 17, 1781), however, the momentum of war turned against the British. Generals Nathanael Greene and Daniel Morgan employed unusual but brilliant strategy to stop the Redcoats as they retreated north. Men like Andrew Pickens and Francis Marion continued to frustrate the British. 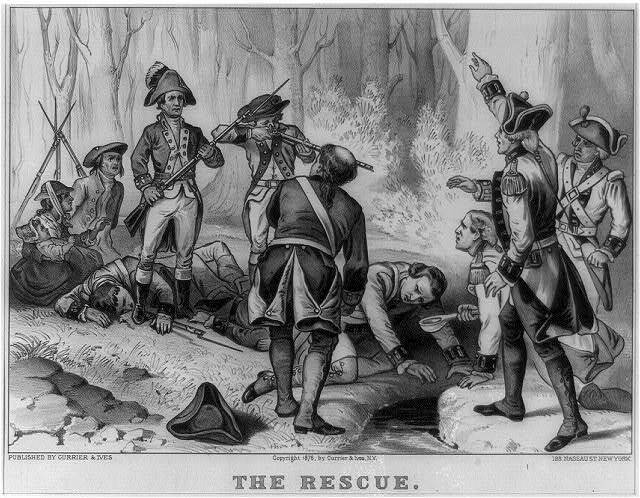 This Currier & Ives lithograph, for example, depicts "Sergeants Newton and Jasper of Marion's Brigade, rescuing American prisoners from the British." Redcoat victories were few and casualties high. The battle of Guilford Courthouse, a technical British victory, left Lord Charles Cornwallis in a weakened position. Things had drastically changed for Cornwallis since the early days of his campaign in the colonies. Many battles had been fought and won by the British, but Cornwallis would soon be known in London as "the man who lost America." By the time Cornwallis and his men reached Yorktown, America was taking full advantage of France's offer to help. French assistance on land, and sea, was key to the ultimate American victory. Ironically, Louis XVI' s decision decision to aid America ultimately cost him his head since a declining French economy - caused, in part, by the American war - led to the French Revolution and, for Louis, the guillotine. Bos, Carole "THE TABLES TURN" AwesomeStories.com. Oct 07, 2013. Apr 24, 2019.